The time we have all been waiting for has finally arrived; peach season. Fresh, local peaches are now available at the Market, and to celebrate we’ve found a fresh summer tomato and peach salad for you to help enjoy your fruit to the fullest! In a large bowl whisk oil, vinegar, honey, salt, and pepper. Slice tomatoes into thick coins and add to the dressing. Remove peach skins and pits, then thinly slice into wedges. Add peaches to the tomatoes and dressing. Shred your chosen herb (basil, mint, coriander), and sprinkle it into salad. Toss to ensure all ingredients are evenly coated. This salad can be consumed immediately or chilled for up to six hours for exceptional results. 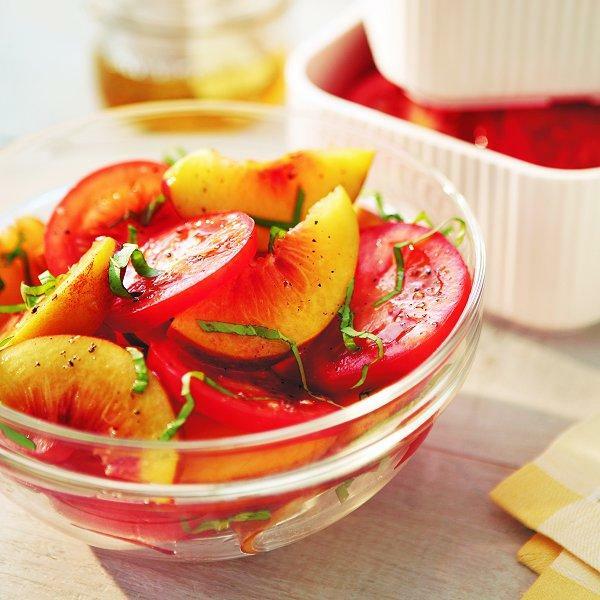 Turn this recipe local through choosing Sheffield’s honey along with local peaches and tomatoes found at the Market.